Koh Ker, one of the provincial cities of the Khmer Empire, was located approximately 85 km northeast of the Angkor monuments. The temples in the Koh Ker monuments were mainly constructed from laterite, sandstone and brick between 921 and 944 AD. The laterites used in the Koh Ker monuments are difficult to classify based on their appearance. However, using a portable X-ray fluorescence analyzer it was possible to distinguish two distinct types of laterite based on Sr content. Laterite blocks used in construction of the Koh Ker monuments either had a low Sr content of less than 300 ppm or a high Sr content of greater than 400 ppm. Significant quantities of quartz were observed in the low Sr content laterites, whereas the high Sr content laterites had relatively low quartz content. Differences in the magnetic susceptibility also were observed for these laterites. Using both Sr contents and magnetic susceptibilities of the laterite blocks, in combination with the assumption that the construction site proceeded in an outward manner, we identified five distinct laterite types associated with different stages of construction. Five different stages of construction were identified in the buildings of the Koh Ker monuments; each stage is characterized by a different laterite source rock. We believe that the brick sanctuaries are the oldest buildings, followed by the sandstone sanctuaries, while the laterite sanctuaries were constructed last. The laterite blocks with high Sr content were likely supplied from quarries around the Srayang village, which is located immediately to the south of the Koh Ker monuments; provenance of the low Sr content laterites is yet to be determined. The Khmer temples, also known as the Khmer monuments, were constructed by the Khmer people between the 9th and 15th centuries AD. These temples are distributed throughout Cambodia, Thailand, Laos and Vietnam. The center of the Khmer Empire was located around Siem Reap, close to the northern coast of the Tonle Sap Lake. The Khmer monuments around Siem Reap are called the Angkor monuments. 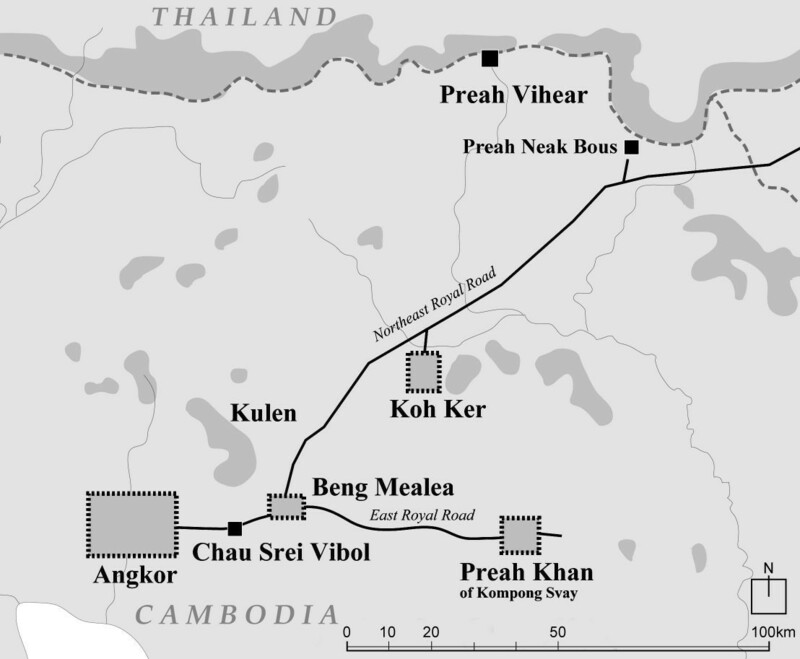 Koh Ker, one of the provincial cities of the Khmer Empire, was located approximately 85 km northeast of the Angkor monuments, along the north east royal road continuing on to Wat Phu (Figure 1). The temples in the Koh Ker monuments were constructed between 921 and 944 AD, when the capital was moved from the Angkor area to the Koh Ker area. During this time, Koh Ker was under the reign of Jayavarman IV, while the Angkor area was under the reign of Isanavarman II until 928 AD. The two capitals, Angkor and Koh Ker, existed simultaneously from 921 to 928 AD. Map showing the location of the Koh Ker monuments, Cambodia. Research into the Koh Ker monuments was initiated by Delaporte  and was pursued further by Harmand , Aymonier , Lunet de Lajonquière , Groslier  and Parmentier . Most recent studies of the monuments include the research of Jacques and Lafond , Evans , and Mizoguch and Nakagawa . The Koh Ker monuments consist of Prasat Thom, the largest temple, and several other small to medium-scale temples (Figure 2). To date, the remains of 76 temples have been confirmed in the Koh Ker area. Prang, which is a five-tiered stepped pyramid surmounted by a huge linga with two-tiered platforms, is located at the west end of Prasat Thom. At the Angkor monument site, temples are positioned along a main axis that runs east to west. However, at the Koh Ker monument site, the main axes of some of the temples, including Prasat Thom, are shifted approximately 14 degrees in a counterclockwise direction from the due east–west axis; while other temples are orientated along this east–west axis. There is a large reservoir known as Rahal that extends approximately 1200 m in a north–south direction and 600 m in an east–west direction, located southeast of Prasat Thom. The main axis line of Rahal reservoir also is shifted 14 degrees in a counterclockwise direction from the due east–west axis line. Since the Koh Ker monuments occur in an area that slopes downwards from the south to the north, it is generally believed that the main axis line of the Rahal reservoir was dictated by the topography of the Koh Ker area. Thus, the main axis line of Prasat Thom was consequently also rotated from the east–west line . The north east royal road is located approximately 6 km northwest of Prasat Thom, and there is a causeway to Prasat Thom from the royal road. 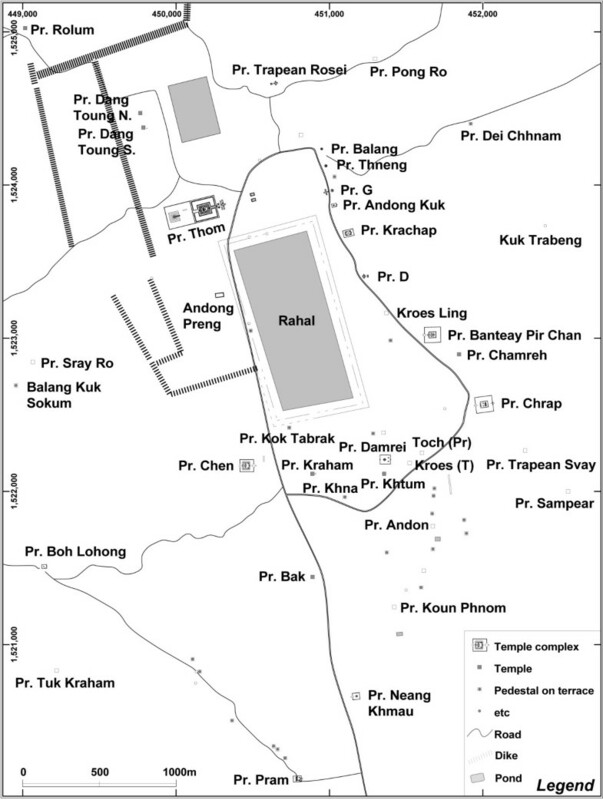 Map showing the distribution of temples in the Koh Ker monuments. The Koh Ker monuments were constructed from sandstone, laterite, and brick in a similar manner to the Angkor monuments. We were unable to establish clear differences in the chemical composition or magnetic susceptibility of the sandstone blocks used in construction of the Koh Ker monuments. However, differences were observed in the chemical composition and magnetic susceptibility of the laterite blocks among the temples at this site. Our analyses reveal that the laterite blocks can be classified into two different types based on their chemical composition. In addition, differences in the magnetic susceptibility of the laterites also exist. Based on these results, we have been able to establish the construction sequence of the Koh Ker monuments. Field measurements using a portable X-ray fluorescence analyzer and a portable magnetic susceptibility meter were carried out on sandstone and laterite blocks in the Koh Ker monuments, as well as on laterites outcropping in the area close to the Srayang village, immediately south of the Koh Ker monuments. Chemical composition and magnetic susceptibility were determined in laterite blocks from 14 different temples, where laterite was used as a major construction material. These temples include: Prasat Thom, Prasat Krachap, Prasat Neang Khmau, Prasat Chen, Prasat Kraham, Prasat Damrei, Prasat Bak, Prasat G, Prasat D, Prasat Trapean Rosei, Prasat Banteay Pir Chan, Prasat Pram, Prasat Khtum, and Prasat Chrap. Prasat Andong Kuk, made almost entirely out of laterite, was not included in this study because it is generally accepted that this temple was constructed at the end of the 12th century by Jayavarman VII, and not during the Koh Ker period . Using magnetic susceptibility measurements from the sandstone blocks in the Angkor monuments, we successfully determined the construction sequence and the provenance of the sandstones in these monuments [11–14]. In this study, magnetic susceptibility measurements of laterite blocks in the Koh Ker monuments were investigated for the same purpose. Measurements carried out using an SM30 portable magnetic susceptibility meter (ZH Instruments, Brno, Czech Republic) are non-destructive and give an accuracy of 1 × 10-6 SI units for measurement times of approximately 2 seconds. Measurements from the flat surfaces of 50 laterite blocks gave an average value for each building. Magnetic susceptibility of the laterite was attributed to the presence of maghemite, as well as goethite and hematite, as will be discussed later. Magnetic susceptibility measurements also were recorded for the gray to yellowish brown sandstone in the Koh Ker monuments, as well as for laterite in local outcrops. The laterite blocks were analyzed with a non-destructive portable X-ray fluorescence analyzer (pXRF) α-4000 of Innov-X Systems Ltd, Waltham, MA, USA. Measurements were carried out using ‘Soil mode’ software, with a measurement time of 60 seconds. Only fresh flat surfaces of laterite blocks were measured. To address the inherent macroscopic heterogeneity of laterites, we conducted measurements at five to 10 different points on each building, and calculated average values for each building. Prior to analysis, we calibrated the pXRF using both Japanese standard rock samples  and laterite samples (Nos.3309 to 3314) analyzed by Activation Laboratories Ltd., Ontario, Canada. 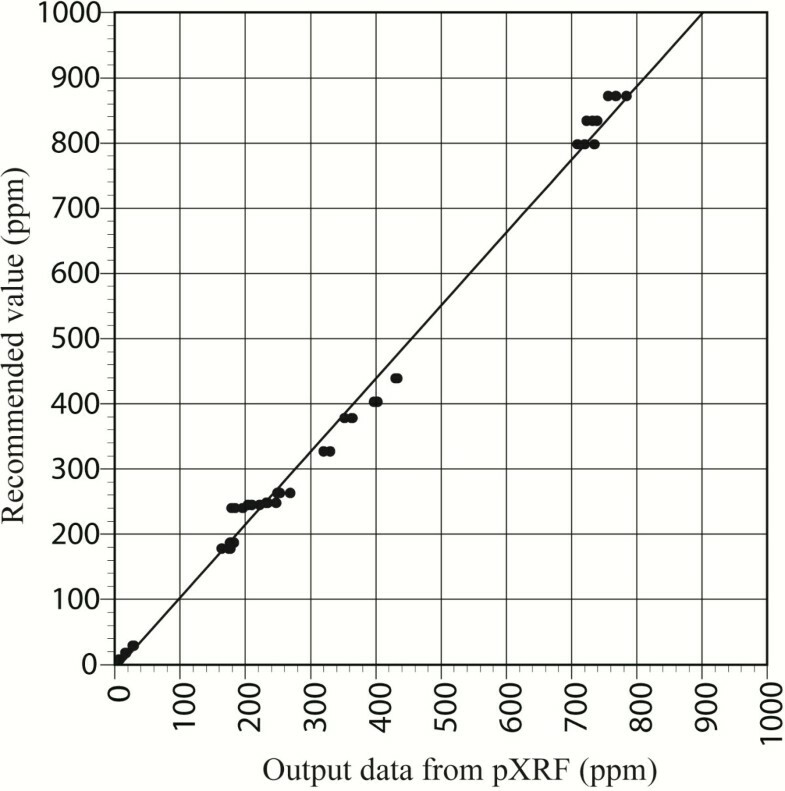 The calibration curve obtained for Sr is shown in Figure 3. The standard deviation (1 σ) for this calibration curve was 9 ppm. Calibration curve for Sr analysis for the Innov-X α4000 portable X-ray fluorescence analyzer, obtained using both Japanese standard rock samples and laterite samples (Nos. 3309 to 3314) analyzed by Activation Laboratories Ltd..
Chemical analyses were also undertaken to determine the presence of minor elements in representative laterite samples collected from the Koh Ker monuments, and from several outcrops in vicinity of the Srayang village. All laterite samples collected from the monuments were from fallen stones. The laterite samples were pulverized using a vibration mill made of tungsten carbide, which consequently contaminated samples with W and Co; both these elements were subsequently removed from the analytical results. Chemical analyses were carried out by Activation Laboratories Ltd. Sixty-one elements were analyzed using inductively coupled plasma atomic emission spectroscopy (ICP-AES) and mass spectroscopy (ICP-MS) with either the 4Litho or 4E-expl code. The sandstone used for the construction of the Koh Ker monuments is a gray to yellowish brown sandstone (feldspathic arenite), which also was used to build the Angkor monuments. It is generally believed that this material is derived from the Jurassic Grés Rouge Formation. However, the use of sandstone as a major building material for the construction of sanctuaries, such as those at Prasat Balang, Prasat Thneng, Prasat G, Prasat Trapean Rosei and Prasat Khna, is rare. In the Koh Ker area, outcrops of gray to yellowish brown sandstone can be found near Prasat Khna, Prasat Neang Khmau, and several other temples. In addition, ancient quarries of gray to yellowish brown sandstone have been found 6 km to the north of Prasat Thom along the Rongea River, as well as 5 km to the northeast of Prasat Thom in the area east of Prasat Trapean Russei [8, 16]. Hence, the sandstone blocks of the Koh Ker monuments likely originate from the surrounding area rather than from Mt. Kulen, which was used to supply sandstone blocks to the Angkor area. The sandstone blocks of the Koh Ker monuments had magnetic susceptibilities in the range 0.7 to 1.3 × 10-3 SI units (Figure 4). In contrast, the magnetic susceptibilities of the sandstone blocks used in the Angkor monuments during the Koh Ker period were much greater, ranging from 2.3 to 3.0 × 10-3 SI units . These results support the idea that the sandstone blocks used in the Koh Ker monuments were locally supplied. However, a distinct difference was observed between the magnetic susceptibilities of the sandstone blocks used in the Koh Ker monuments and those derived from the ancient quarries along the Rongea River and the area surrounding Prasat Trapean Russei (0.3 to 0.7 × 10-3 SI units). A decrease in the magnetic susceptibility could be owed to alteration of the sandstones in the outcrops, else there were other important sandstone quarries in addition to those along the Rongea River and around Prasat Trapean Russei that have not yet been found. Plan of Prasat Thom (from Japan-APSARA Safeguarding Angkor), showing the average magnetic susceptibilities of the sandstone (red dashed line) and laterite (black line) blocks (×10 -3 SI units). Pisolitic to slightly porous laterite was used in the construction of the Koh Ker monuments. Laterite was used extensively in the construction of the sanctuaries, enclosures, and libraries. It is not possible to visually detect any differences between the types of laterite used in these buildings. X-ray diffraction analysis and observations with a polarizing microscope confirm that the mineral content of the laterite used for the Koh Ker monuments is the same as that found in laterites from the Angkor monuments. The material is predominantly of kaolinite, quartz, goethite and hematite. In addition, a small amount of a strongly magnetic mineral was separated with a magnet, which was later identified as maghemite by X-ray diffraction analysis. The magnetic susceptibility of the laterite could be caused by this small amount of maghemite, and the presence of goethite and hematite, which are weakly magnetic, but abundant in laterite. Close to the Srayang village, immediately south of the Koh Ker monuments, there are many laterite outcrops. Given that there are the remains of several ancient laterite quarries in this area (Figure 5), it is possible that these quarries provided the laterite material used for the construction of the Koh Ker monuments . Hence, we have investigated both the laterite blocks used in the Koh Ker monuments, as well as the laterite outcrops close to the Srayang village. Ancient laterite quarries around the Srayang village: (a) laterite quarry at N13° 42′ 24.8″ and E104° 32′ 32.7″; and (b) laterite quarry at N13° 42′ 29.9″ and E104° 32′ 38.6″. The average magnetic susceptibilities of the laterite blocks used in the Koh Ker monuments ranged from 1.0 to 5.2 × 10-3 SI units (Figure 6). Lowest magnetic susceptibility was recorded in the palaces of Prasat Thom, whereas the highest value was recorded in the sanctuary of Prasat Neang Khmau. The values were mostly in the range of 1.3 to 3.5 × 10-3 SI units. At the Angkor monuments, the average magnetic susceptibilities were found to be low for the porous laterite (0.3 to 0.6 × 10-3 SI units), but relatively high for the pisolitic laterite (0.7 to 1.6 × 10-3 SI units) . Average magnetic susceptibilities of the laterites in the Koh Ker monuments tended to be higher than those in the Angkor monuments. This difference is attributed to the richer iron content (Fe as Fe2O3: 42 to 53 wt.%) of the laterites in the Koh Ker monuments compared with those of the Angkor monuments (Fe as Fe2O3: 24 to 48 wt.%) (Table 1). Construction sequence of the Koh Ker monuments deduced from changes in the average Sr contents and the average magnetic susceptibilities of the laterite blocks used in the Koh Ker monuments. 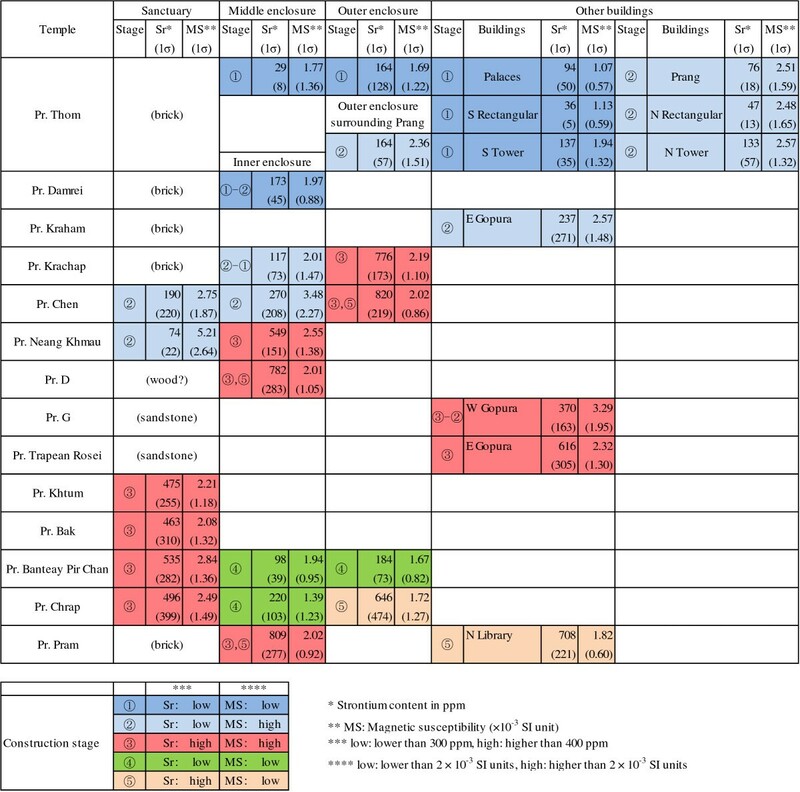 Chemical compositions of the laterite samples collected from the Koh Ker monuments, determined by Activation Laboratories, Ltd.
Banteay Pir Chan Outer Encl. Magnetic susceptibilities of the laterites distributed around the Srayang village ranged from 1.3 to 3.1 × 10-3 SI units, covering the same range as laterites from the Koh Ker monuments. Chemical analyses by Activation Laboratories Ltd. of representative laterite samples collected from the Koh Ker monuments are summarized in Table 1. 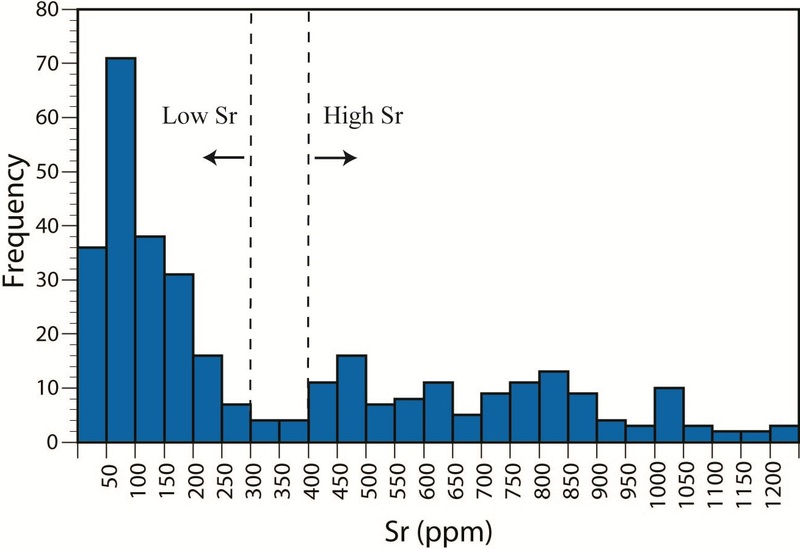 Of all the elements analyzed, Sr showed the most remarkable variation between samples. Hence, we carried out non-destructive analyses using the pXRF on the laterites used in each building of the Koh Ker monuments, focusing on the Sr content (Additional file 1). Using these results, the laterites could be classified into two types based on their average Sr content: one had a low Sr content of less than 300 ppm, and the other had a high Sr content of greater than 400 ppm (Figure 7). Histogram showing the Sr contents of laterite blocks used in the Koh Ker monuments. The boundary between the laterite blocks rich in Sr and those poor in Sr was between 300 and 400 ppm. Even in the same temple, laterite blocks from the sanctuaries, libraries and enclosures generally had different average Sr contents. In Prasat Thom, the largest temple of the Koh Ker monuments, the Sr content of the laterite was low in all blocks (Figure 4). In contrast, the Sr contents of the laterite blocks of Prasat Chrap, a middle-scale temple, were high in the sanctuaries and the outer enclosure, but low in the inner enclosure. These results suggest that the laterite quarries used to provide materials in the construction of these temples changed over time. Although it is not possible to distinguish between low Sr and high Sr laterite types visually, the low Sr type is much richer in quartz under the microscope. In the Angkor monuments, we noticed that laterites with high Sr content tended to be rich in As . However, the As content was generally less than 30 ppm (below the detection limit of As by the pXRF) in all of the laterite blocks analyzed from the Koh Ker monuments. The laterite from outcrops distributed around the Srayang village was found to be rich in Sr (1093 ± 475 ppm). High Sr content laterites from the Koh Ker monuments are relatively rich in Ti, P and light rare earth elements, but low in Pb and V (Table 1). Likewise, the laterites from outcrops around the Srayang village also were rich in Sr, Ti, P, and light rare earth elements. These results suggested that the high Sr content laterite used in the Koh Ker monuments was supplied from an area close to the Srayang village. Quarries that match the composition of the low Sr content laterites are yet to be found. Based on the chemical composition of the building blocks, especially the Sr content and magnetic susceptibilities of the laterite blocks, we attempted to reconstruct the construction process of the Koh Ker monuments. We operated under the assumption that the temples were built from their center outwards; that is, starting with the sanctuaries and progressing to the inner and then outer enclosures, except for the libraries. This allowed us to distinguish five stages of construction (Figures 6 and 8). Plot showing average Sr content vs average magnetic susceptibility value for the laterite blocks used in the buildings of the Koh Ker monuments, shown in Figure 6 . An architectural study of Prasat Thom showed that it was constructed in two stages : the area surrounded by triple enclosures and the palaces were constructed first (the first stage), followed by the construction of the enlarged areas (the second stage). The enlarged areas include the east gopura located to the east of Prasat Kraham, as well as the Prang (a stepped pyramid) and its surrounding enclosure (Figure 4). In the enlarged areas, the sandstone blocks were larger than those used in the areas constructed during the first stage, and the construction remained unfinished. The Sr contents of the laterite blocks from different points of Prasat Thom were all low; no differences were observed between Sr contents of laterite blocks used in the first and second stages of construction. However, average magnetic susceptibilities of laterite blocks from these two construction areas were different. The middle and outer enclosures, as well as the palaces had average magnetic susceptibilities of 1.77 ± 1.33 × 10-3, 1.64 ± 1.22 × 10-3 and 1.07 ± 0.57 × 10-3 SI units, respectively. In contrast, the Prang and the surrounding enclosure of Prasat Prang had higher magnetic susceptibilities of 2.51 ± 1.59 and 2.36 ± 1.51 × 10-3 SI units, respectively. Thus, the first and second stages of construction can be differentiated based on a magnetic susceptibility value less than or greater than 2 × 10-3 SI units. There are many laterite buildings located between the inner sandstone enclosure and the middle laterite enclosure. With the exception of the two buildings situated in the northeast and southeast corners of this enclosed area, all the laterite blocks had low average magnetic susceptibilities with values in the range of 0.91 to 1.87 × 10-3 SI units. This suggests that these laterite buildings were built during the first stage of construction. In contrast, the average magnetic susceptibilities of the laterite buildings in the northeast and southeast corners were higher, with values of 3.33 ± 1.96 and 3.83 ± 2.40 × 10-3 SI units, respectively, suggesting that these buildings were built during the second construction stage (Figure 4). Furthermore, there are a pair of long rectangular buildings and a pair of towers to the east of Prasat Kraham. The magnetic susceptibilities of the southern rectangular building and tower were 1.13 ± 0.59 and 1.94 ± 1.32 × 10-3 SI units, respectively; whereas those of the northern rectangular building and tower had higher values of 2.48 ± 1.65 and 2.57 ± 1.32 × 10-3 SI units, respectively. These measurements suggest a time lag in the construction of these buildings; the southern set was likely built during the first stage of construction, while the northern set was built during the second stage of construction. The distribution pattern of laterite types indicates that although a low Sr content laterite was used in the early stage of the Koh Ker monuments, one with a low magnetic susceptibility of less than 2 × 10-3 SI units was used in the first stage of construction, while another with higher magnetic susceptibility was used during the second stage of construction. Using this criterion, we established other buildings constructed during the second stage. These include the enclosure of Prasat Damrei (1.97 ± 0.88 × 10-3 SI units), the inner enclosure of Prasat Krachap (2.01 ± 1.47 × 10-3 SI units), the east gopura of Prasat Kraham (2.57 ± 1.48 × 10-3 SI units), the sanctuaries of Prasat Chen (2.75 ± 1.87 × 10-3 SI units), and the sanctuary of Prasat Neang Khmau (5.21 ± 2.64 × 10-3 SI units). The enclosure of Prasat Damrei may have been constructed at some point between the first and second stages. 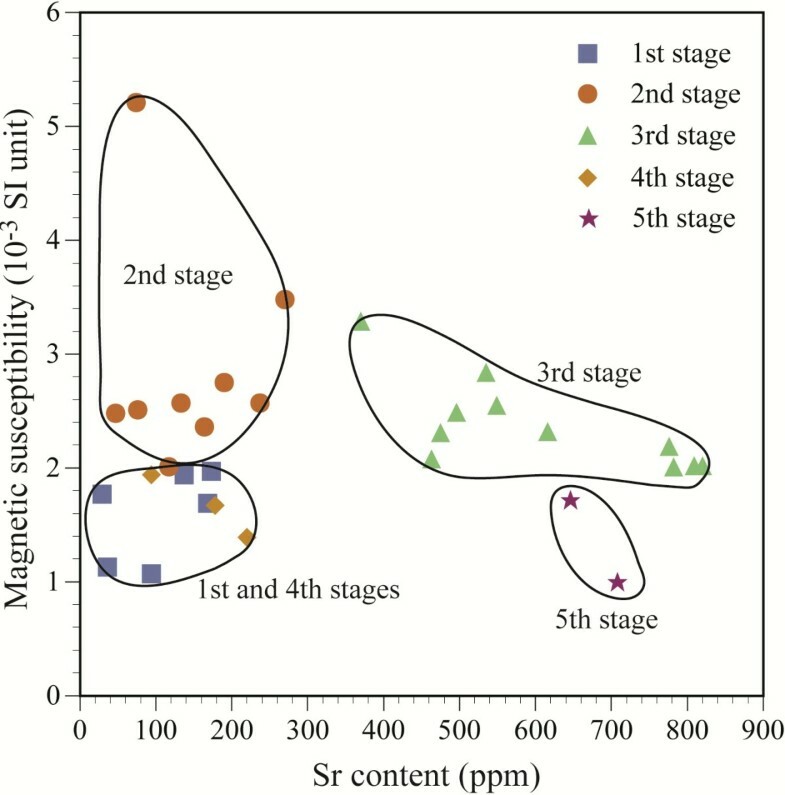 A third stage in construction is associated with laterite with a high Sr content of more than 400 ppm and high magnetic susceptibilities of more than 2 × 10-3 SI units (Figures 6 and 8). The following buildings have been identified as most likely to have been built during the third construction stage: the sanctuaries of Prasat Bak (2.08 ± 1.32 × 10-3 SI units), Prasat Banteay Pir Chan (2.84 ± 1.36 × 10-3 SI units), Prasat Khtum (2.21 ± 1.18 × 10-3 SI units) and Prasat Chrap (2.49 ± 1.49 × 10-3 SI units), the inner enclosures of Prasat Neang Khmau (2.55 ± 1.38 × 10-3 SI units), Prasat D (2.01 ± 1.05 × 10-3 SI units) and Prasat Pram (2.02 ± 0.92 × 10-3 SI units), the outer enclosures of Prasat Chen (2.02 ± 0.86 × 10-3 SI units) and Prasat Krachap (2.19 ± 1.10 × 10-3 SI units), the west gopura of Prasat G (3.29 ± 1.95 × 10-3 SI units) and the east gopura of Prasat Trapean Rosei (2.32 ± 1.30 × 10-3 SI units). Given that laterite blocks with low levels of Sr were frequently observed in the sanctuaries of Prasat Bak, Prasat Banteay Pir Chan, Prasat Khtum and Prasat Chrap, as well as the west gopura of Prasat G, it is possible that the same laterite material used in the second stage of construction was also used to build these sanctuaries and gopura. The sanctuaries of Prasat G and Prasat Trapean Rosei were made of sandstone. The sandstone blocks used for these buildings were relatively large and unfinished, except for the platform and the pedestal. Hence, we believe that the sanctuaries of Prasat G and Prasat Trapean Rosei were most likely built during the second stage, coincident with Prasat Balang, Prasat Thneng, and Prasat Khna. The use of laterite blocks with low Sr content and magnetic susceptibility values less than 2 × 10-3 SI units in Prasat Banteay Pir Chan and Prasat Chrap corresponded to a fourth stage of construction. Based on their magnetic susceptibility values, the inner (1.94 ± 0.95 × 10-3 SI units) and outer enclosures (1.67 ± 0.82 × 10-3 SI units) of Prasat Banteay Pir Chan, as well as the inner enclosure of Prasat Chrap (1.39 ± 1.23 × 10-3 SI units) were built during this stage of construction. We also recognized a fifth stage of construction, involving the use of laterite blocks with a high Sr content and low magnetic susceptibility values of less than 2 × 10-3 SI units in Prasat Chrap. The laterite blocks of the outer enclosure of Prasat Chrap were found to be rich in Sr (646 ± 474 ppm) with an average magnetic susceptibility of 1.72 ± 1.27 × 10-3 SI units. The south and east-facing sides of the outer enclosure of Prasat Chrap were unfinished and had no decoration on their surfaces. These observations support the idea that the outer enclosure of Prasat Chrap was built during the fifth and final stage of construction. Magnetic susceptibility of the laterite blocks was high on the north-facing side, but low on the west-facing side. Therefore, the possibility exists that the laterite blocks of the outer enclosure of Prasat Chrap were supplied from two different quarries. The laterite from the northern library of Prasat Pram had a high Sr content of 708 ± 221 ppm and a low magnetic susceptibility of 1.82 ± 0.60 × 10-3 SI units. The northern library of Prasat Pram also was likely built during the fifth stage of construction. In contrast to the northern library, the southern library at Prasat Pram was built from brick. This change in building materials suggests that the northern library was constructed later than the southern library, and later than the enclosure. The surfaces of the laterite blocks used to build the northern library of Prasat Pram were also unfinished, supporting the idea that the northern library of Prasat Pram was built during the fifth and final stage of construction. Using the assumption that the temples were constructed in an outwardly propagating manner, we have been able to distinguish five different construction stages based on changes to the Sr contents and the magnetic susceptibilities of the laterite blocks used in construction. The construction process was defined by: (1) a first stage using laterites with low Sr content and low magnetic susceptibility values; (2) a second stage using laterites with low Sr content and high magnetic susceptibility values; (3) a third stage using laterites with high Sr content and high magnetic susceptibility values; (4) a fourth stage using laterites with low Sr content and low magnetic susceptibility values; and (5) fifth stage using laterites with high Sr content and low magnetic susceptibility values (Figures 6 and 8). Almost all of the buildings in the Koh Ker monuments belong to the first three stages, with only three and two buildings belonging to the fourth and fifth stages, respectively. Buildings belonging to the fifth stage remained unfinished. Buildings made of sandstone were limited to the first and second stages of construction. The sandstone blocks used in the second stage were larger than those used in the first stage. We have assumed that the brick sanctuaries are the oldest (i.e., Prasat Thom, Prasat Damrei, Prasat Kraham, Prasat Krachap and Prasat Pram), followed by the sandstone sanctuaries (i.e., Prasat G and Prasat Trapean Rosei), with the laterite sanctuaries being constructed last of all. The laterite sanctuaries of Prasat Neang Khmau and Prasat Chen were constructed earlier than those of Prasat Khtum, Prasat Bak, Prasat Banteay Pir Chan and Prasat Chrap. Since the Koh Ker monuments comprise many temples, a detailed timeline showing the construction of these buildings has not yet been determined. However, the findings presented in this study will greatly assist in the reconstruction of a timeline for the Koh Ker monuments. This study was carried out with the cooperation of Authority for Protection and Management of Angkor and the Region of Siem Reap (APSARA National Authority). It was financially supported in part by Grants-in-Aid for Scientific Research of the Japan Society for the Promotion of Science [Grant nos 23401001 (E. Uchida) and 20297336 (A. Mizoguchi of Meijo University)]. EU conceived of this study. EU and KT carried out the field work. EU, KT and IS interpreted data. EU drafted the manuscript and IS revised it critically. All the authors read and approved the final manuscript.